Family & friends: Dinners with people whom I share a lifetime of history with (with wine, haven’t had that in six months). Talking about our experiences and hearing about everyone else’s six months. And simple banter with the guys, where a crass joke follows a crude one. Being back in a system that works, where people have real choices, where you find innovation, creativity, culture… a million different ideas from people who try to create something every day. My electric guitars, musical friends, and a massive amplifier. Concerts and nightclubs, where the bass pulsates through every bone in your body. Fresh food… Mozzarella di Bufala, antipasti, feta, salads, a freshly baked ciabatta. Driving in the hills around Zurich. The simplicity of life lived at a totally different pace. The 1000 exhausting greetings every day… acknowledging everyone you see, even if it’s from a moving car. The archetypal, awe-inspiring, Avatar-trumping nature of this cradle of life. Our fellow volunteers and all the other great people we’ve met here. My many street kid friends…who will replace that humor, that enthusiasm, that perseverance of the toughest people I know? A great book on neuroscience that I’m currently reading gives an interesting evolutionary twist to the story: As the author, Dr. Ramachandran argues, tickling may have evolved as an early playful rehearsal for adult humor; a pre-form of humor, if you will. Much like an adult in danger, the child’s instinct when faced with a menacing monster – the adult about to tickle them – is to react with fear and flee, but when the giant turns out to be gentle instead, the expectation of danger is released in the form of explosive laughter. Perhaps tickling works universally because it taps into our deep-seated wish to be loved through touch and our instinctive reaction to a potentially dangerous-turned pleasant surprise: the monster is friendly after all! Thank you, Hamisa and Mwanaisha, for reminding me once again what it means to laugh for no reason, enjoy the moment for no reason and just be: Joyous, pure and at peace. Moshi, We Have a Problem. I come bearing gifts of equatorial Christmas cheer a day later than planned as our internet bailed on us last night and WordPress kept acting up (hence the messy formatting of this post). Although I feel a million miles away from the wintery vibes back home and even more distant from the mulled-wine-by-candle-light Christmas mood, Saturday was the annual ‘Kristmasi’ party for the Amani kids and neighborhood tots, complete with a borderline inappropriate Santa who was grinding his way through the audience, ‘giftis’ for each kid and mountains of local delicacies, washed down with liters of Coca Cola beverages. The day was hot, action packed, fun and totally and utterly exhausting. (At one point I thought I was going to spontaneously combust, having run around in the blistering heat taking photos of hundreds of over-excited kids for hours.) All staff arrived at 8am to prepare the day all the kids had been given a new set of clothes the night before. Beaming with pride over their new outfits and fresh kicks they all had this amazing, confident swagger about them as they ran out to greet us. For the love of math (after school & unprompted). In a country that struggles to educate its children it’s inspiring to see how eager they are to learn despite the fact that the odds are stacked up against them in such a fundamental way. Although Amani does a very good job at providing adequate resources and good teachers to the kids that go to school there – and in that sense our kids are lucky compared to their otherwise more fortunate peers – most government schools really, really struggle. The 800-student village school we visited a month back was a ‘good’ example; schools in more remote areas are an even more sorry affair with no teachers and no learning materials to speak of. The buildings might be there, the eager students in their tattered but sweet uniforms show up every morning, but the infrastructure to learn just isn’t available. 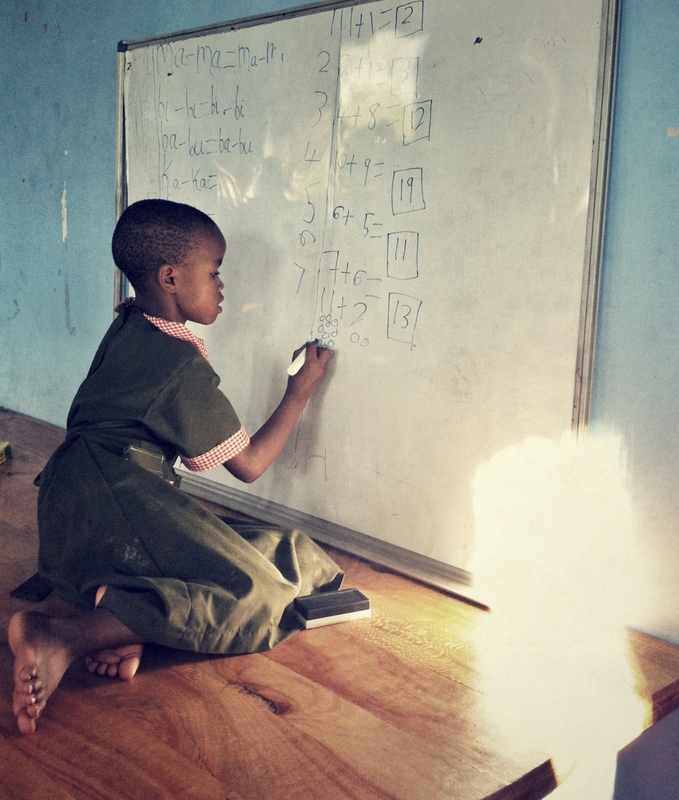 Even if you take corruption and embezzlement of state and aid funds out of the equation, what does a country like Tanzania with almost no taxable income and few examples of success do about more than 20 million children who desperately need and want an education? Is the government to blame for the sorry statistics – literacy rates are decent but only 54% actually graduate primary school, a sad seven percent make it through high school – or is the equation of too little money with far too many children just impossible to solve? Given that many of the Amani kids have been so hungry to learn for most of their lives, they’re amazingly unselective about how and what they learn. They’re also incredibly patient. From 9-year old Mwanaisha sitting in front of the whiteboard after school doing maths on her own just before the library closes, to 14-year old Mudi spending a good hour just going through alphabet cards with Boogie in the library, trying to remember and memorize letters with a patience and persistence you rarely see in an adult, their enthusiasm is heart-warming and somehow deeply humbling. Rama, another teenage boy, spent nearly two hours after class learning how to pronounce English words with Boogie and afterwards just picked up another book and sat down to read it on his own, while one of the roughest kids at Amani, a 17-year old who doesn’t read a word and understands little English, came over with a Cinderella book and asked that Boogie read it for him… Can you even imagine that happening back home?